SilkDamask : What Shoes Did Mistress Firebrand Wear? Given the character and the profile Donna shared, we agreed that we had some latitude for dazzle, sparkle and shine. The London and New York connections made it possible to consider a wide scope of footwear styles and materials. Some of the leading cordwainers (in terms of elite audience, skill, and high-end production values) who were in Georgian London and participated in active trade with New York and New England, would have been John Hose & Son; Thomas Ridout & James Davis, and William Chamberlain & Son. 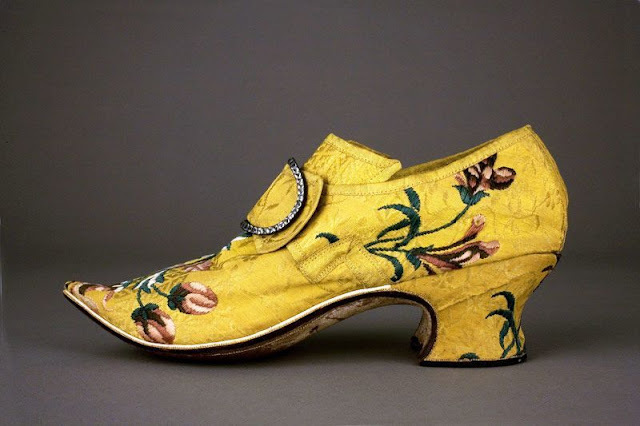 Bright yellow silk brocades and damasks, with metallic lace and silver threads, red leather Moroccan pumps or scarlet silk satins shoes, seemed appropriate candidates. 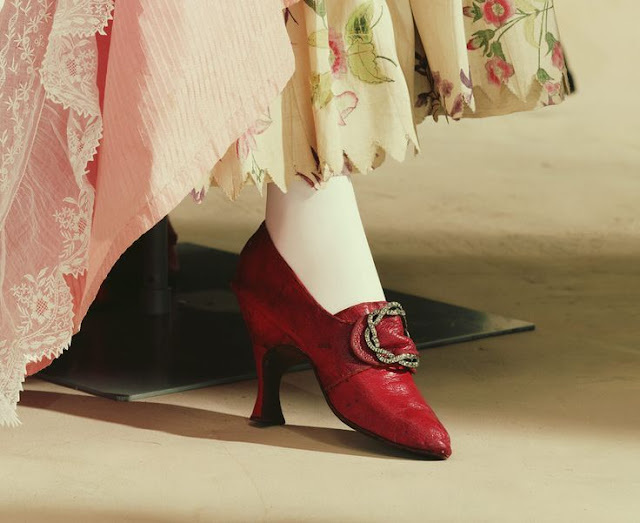 Visual clues, such as the expense of the accessories and textiles, would have been instantly understood by the audience. The contenders were from several museum collections. And the winner is…..
Yellow, with bright red creating an exotic “Chinoissere” effect. Not only would the silk have a shimmer, check out that wide band of costly metallic lace which runs from toe to vamp to throat. The thick expanse of lace (or braid) just shouted luxury. 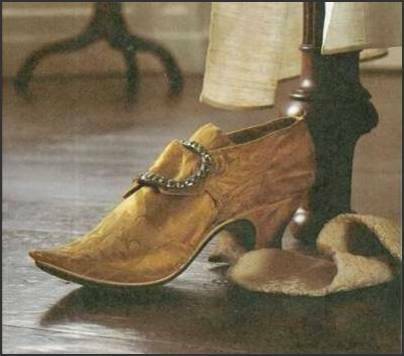 These shoes would have been noticed anywhere! 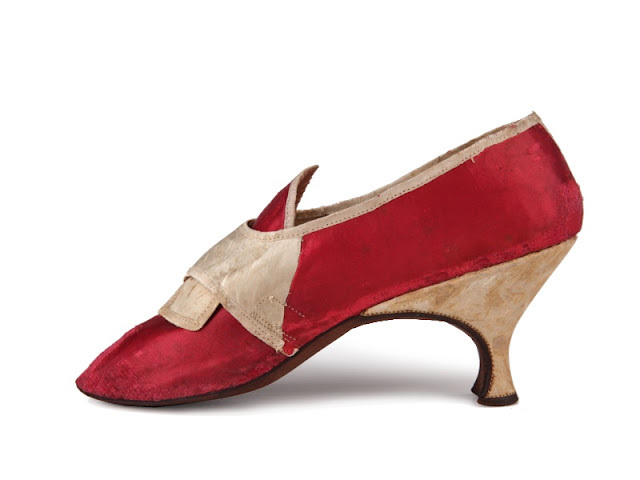 They are in the Metropolitan Museum collection; but this is the only view given – would love to see the heel. 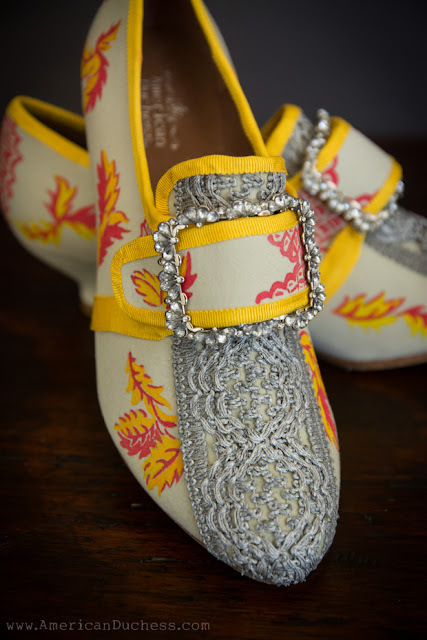 2) London-made silk brocade shoes, ca. 1760, are said to have been owned by Mercy Otis Warren. They are in the collection of the Plymouth Antiquarian Society. 3.) 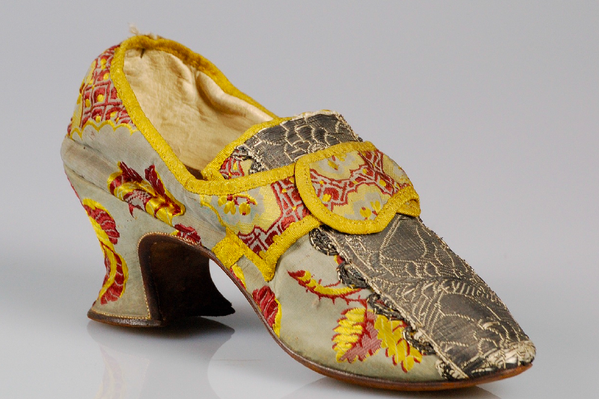 Fabulous Rococo shoes by London cordwainer’s Ridout & Davis, who carried on their trade near Aldgate. These are in the collection of the Peabody Essex Museum. Mid 18th century, silk brocade. 4.) Another pair by Ridout and Davis, these are in the collection of Colonial Williamsburg but hail from Maine. They are in fabulous condition. Mid 18th century, silk brocade. 6.) This shoe is sizzles! Super high heel, red Moroccan leather. Kyoto Costume Institute. Not only would the high quality of the supple leather have conformed to the wearer's foot, the elegance of the higher-than-usual, slender Louis heel, would achieve the profile many women seek - then and now. Most likely French, c. 1770s-1780s. JG-Shoe is different from other online custom-made shoe sites. You don’t start with an imaginary shoe. You simply choose a design you like and request adjustments to suit your style. You can request a platform or order a different heel height. You can add an embellishment or select a different color or fabric. You’ve just designed your own pair of shoes and our experienced craftsmen create it especially for you.